Do you remember the quirky bird in Mrs. Frisby and the Rats of NIMH? He was a crow. Or a blackbird, maybe? I’m not sure. No matter. If memory serves, his name was Jeremy and he had a fetish for shiny things. Little bits of this and little scraps of that would grab his attention. He'd swoop down out of the sky, grab whatever glittery treasure he could fit into his beak, and carry it back to his awaiting lady friend. He wasn’t necessarily obsessed with sparkle, just distracted. Silvery tinsel-like things caught his attention and tugged at his gaze. When it comes to curriculum and school plans each fall, I can sometimes be a bit like Jeremy—overly attracted to the shiny—distracted by all the possibilities of a brand new year. I tend to grab at lots of great things in hopes of packing them all into my almost-perfect school day. This year was no exception. I may or may not have hoarded too much shiny. Fortunately for me, time has a way of making wrong things right. It's never too far into the school year when I notice the tension of too-much. I can quickly see at a glance what is working. And since I know the simple antidote for curriculum guilt, I can jettison all the rest. 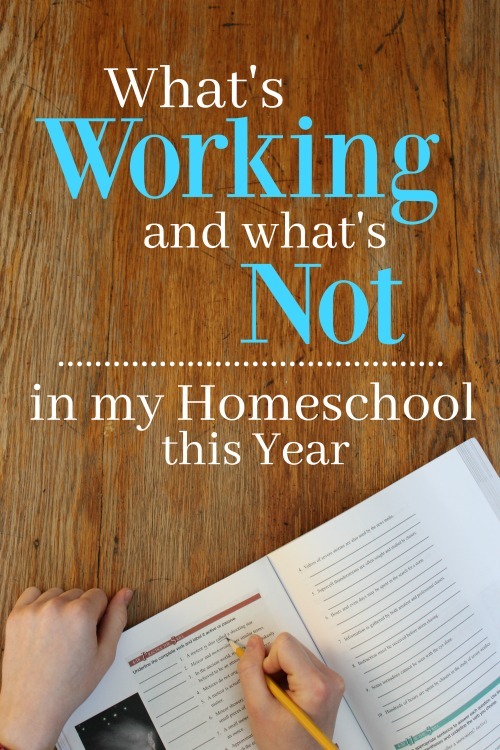 Here's a peek at what's working and what is NOT in my homeschool this year. There are several line items in the day that are absolute MUSTS. They are immovable standards that have stuck with us for many years. They are working, have worked, and will (no doubt) continue working in our homeschool because like an old glove, they just fit. Our non-negotiables include Morning Time, silent reading, afternoon read alouds, and TruthQuest history. You can't pry any of these away from my bony fingers, so don't even try. As always, Teaching Textbooks is going strong. Several years ago, it became all too obvious that I did not have the emotional fortitude for teaching numbers. I could not handle all the tears...theirs or mine. And then along came my math crush, Teaching Textbooks. Y'all, TT workbooks and CDs should come with capes. They have unnatural super hero powers. Math SANS tears. My daughter is learning geometry this year and I don't have to be involved in it one little bit. I just flash some fingers guns and a proud smile when she shows me her scores and then I go back to my regularly scheduled program (which NEVER includes geometry, but don't tell her that). Surprisingly, BJU video program has been a solid win for 9th grade science. I was a little leery about ordering a video program that came with workbooks, tests, quizzes, and the like. After all, it's not at all what school usually looks like around here. But as she headed into high school, my daughter asked for more structure to her science lessons. READING and DOING PROJECTS ONLY was just not cutting it anymore. She has sincerely been enjoying the video-based classes. The teacher is a bit on the corny side, she admits, but his explanations, demonstrations, and thorough review have really helped her to grasp each concept for the long haul...not just for the test. Homeschooling never requires me to teach all-the-things. Schooling at home just means that I get to choose what, how, and by whom something is taught. This year, BJU video science has been just about perfect. As I mentioned last summer, I was a bit discouraged after unpacking the world geography program I had purchased. It just seemed kinda average. Disjointed. Underwhelming. You get the idea. So, I pulled up my big girl pants and decided to create my own curriculum. I used the kinda-average "professional" program as a foundation and filled in the cracks with a few other great resources to create a one-of-a-kind, made-to-order world geography program. Not to toot my own horn or anything, but it's kinda rad. Not because it's the best.curriculum.ever (That's a spotted unicorn, folks. ), but because it works for us. On a whim last spring, I picked up a well-worn copy of Do You Know What Tomorrow Is? in hopes of sprinkling in some cultural trivia into our Morning Time. The book is divided chronology and includes a short paragraph about some noteworthy happening that occurred on that particular date sometime in history...like the birthdate of A.A. Milne or the day Florida became a state. These fascinating and mildly random tidbits have fostered so many great conversations this year. The only downside of the book is that some dates list 2-3 historical events while some dates list 0. On those blank dates, I consult This Date in History from my smartphone to carry on the new morning tradition. To be honest, Spanish never even had a chance to launch this year. Towards the end of last summer after watching a movie with subtitles (I think?! ), my daughter had an urge to learn some very basic conversational Spanish. I requested a few resources from the library, began strewing them around the house, and carried on with business as usual. She took the bait and began leafing through book after book. So when school began, I thought I'd continue with my sneaky strewing to see if any of the other kids might grow curious. I had hopes of adding some unofficial Spanish practice to our Morning Time. But, nope. It just didn't take. And that's fine by me. Strewing is about delight. It's about following a child's natural interests and cultivating passions. Since there was clearly no interest nor passion, I gladly took Spanish off the docket. Maybe next year. Then again, maybe not. I was so impressed with Learning Language Arts Through Literature after my oldest son went through one year's worth of the program that I decided to transition all of my other kids over at the start of the 2017-2018 school year. It's an open-n-go Charlottle Mason style language arts curriculum that helped my son make great strides in his writing and basic grammar mechanics. Switching to LLATL was definitely the right move for my elementary-aged boys. The gentle, literature-rich approach was exactly what they needed. Choosing LLATL for my high school daughter, on the other hand, was a fool's errand. The program has been about as useful as bathing a cat. In full disclosure, the Gold Book would be a great resource for anyone wanting to explore World Literature ONLY. But I chose it because I assumed that it would incorporate both literature AND grammar, like all the other previous books in the series. It does not. It includes daily writing assignments and comprehension/discussion questions. While the writing assignments help her use her previously learned grammar skills, they do not teach her any new ones. So about a month into the school year, I made a modified language arts program for her. Every day, she reads the literature selection from the LLATL book on her own, but does not do any of the workbook questions. Instead she and I work through a lesson of BJU English 9 together. In that way, she is getting an introduction to famous world literature AND a good foundation in upper level grammar skills. We're halfway done with the homeschool year and are clipping along at a great pace. We've learned what works and what doesn't. Someday I might finally learn my lesson about shoulda-coulda-wouldas and turn a blind eye to shiny new curriculum. But in avoiding a lot of bad choices, I might inadvertently avoid some really great ones. In this case, the rewards outweigh the risk. Great post. We are going back to TT. My daughter burned out on it, but now missed it after a year away. My daughter took a year off to do Algebra 1 with a co-op class. She returned with a renewed vigor! We switched back to Math U See from TT midway through multiplication for our daughter. We still plan on using TT eventually but for the foundations and memorization of multiplication facts TT just wasnt getting the job done like Math U See. That is an obvious weakness of the program. I incorporate daily math drills to help my kids memorize those important facts. Yes, we did try doing flash cards and math minute style drills too, but even those fell short (learning style-wise) for our daughter. She really needs that repetitive writing of facts in cyclical review. Such a blessing to be able to switch gears as homeschoolers to give her what her brain needs!! Yes! That's one of the best parts. Excuse me if this is a repeat, I tried to post and it didn’t seem to work. But wanted to say that I stumbled on your blog today and am just eating it up. 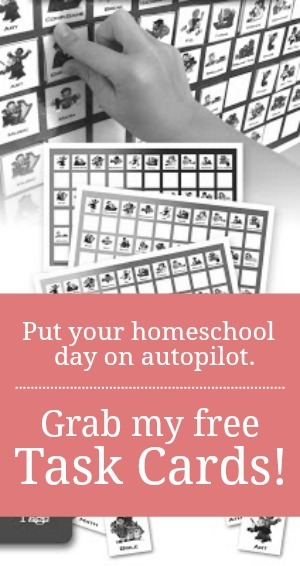 Ijust finished our 4th year homeschooling and it’s a treat to find a good eclectic homeschool blog like yours!!!! One quick question though, do you think you’d continue LLATL next year for your oldest daughter? I’m considering the Gold world lit book for my son who will be 9th grade next year. I don’t mind supplementing grammar to make it complete. Wondering if you thought it was worth it?